Earlier on this year, on Valentine’s day, my brother and his wife had their second baby. When his older brother, age two, was asked what his new brother should be called, he answered: “Silakka” (which means a herring in English). Why he wanted to call his brother after a small and rather mundane type of a fish no one really knows. My sister tried to ask about the logic behind this, but the answer was so cryptic (apparently it had something to do with parrots) that she was none the wiser. But needless to say, the name stuck. Since then the little boy has been christened Touko, which I think is a lovely name, so hopefully he won’t be permanently traumatised by being called after a fish. 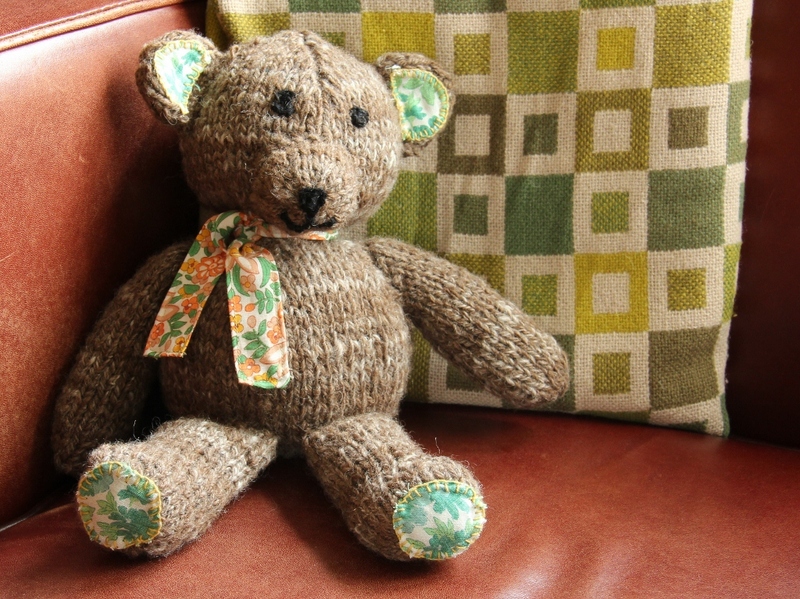 For a christening present I decided I’d like to knit him a teddy bear from a home-spun yarn. I had some yarn spun from Jacob wool, but in the end I thought it wasn’t really soft enough for a small baby so I went with Shetland wool instead as it is soft with a nice woolly feel to it. I had several colours of Shetland available, but I thought Moorit (a lovely medium dark brown) would be the most bear-like shade. I handcarded the fiber into rolags, and while carding I mixed in a bit of fawn (light brown) and white for a slightly speckled look. I then spun it with a long draw for a nice fluffy yarn. I wanted quite a sturdy fabric, so I made it into a 3-ply yarn. I also wanted to felt the yarn a little bit to make it stronger, so it had quite a vigorous finishing process: first I washed it in a very hot water, really agitating it for some time, and then rinsed it with cold water. The pattern for the teddy bear came from Knitted Toy Tales by Laura Long, a book that was recommended in one my favourite blogs, Crochet with Raymond. I’ve never knitted any toys before but it was incredibly easy. I think I placed the nose a little bit too low, but decided not to undo and redo – it is a part of his character. In the end both Hugh and I grew quite fond of this little bear and it was quite hard to give him away, it looked so lovely and comfortable on our arm chair, like it belonged there. 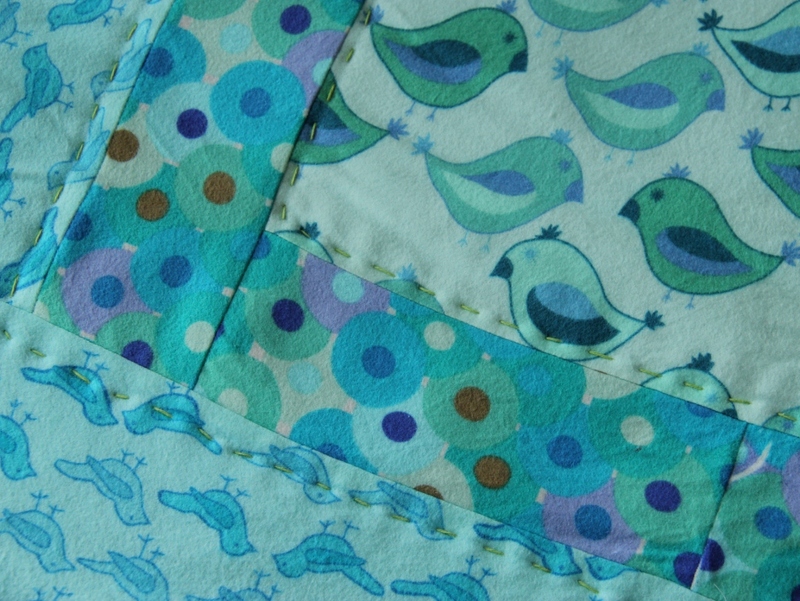 I also made a patchwork blanket for the baby from some lovely soft children’s flannel fabrics (designed by Valori Wells) I had in my stash. I haven’t got any children myself but I adore those fabrics, they’re colourful and fun and not too twee or “over-cute”. 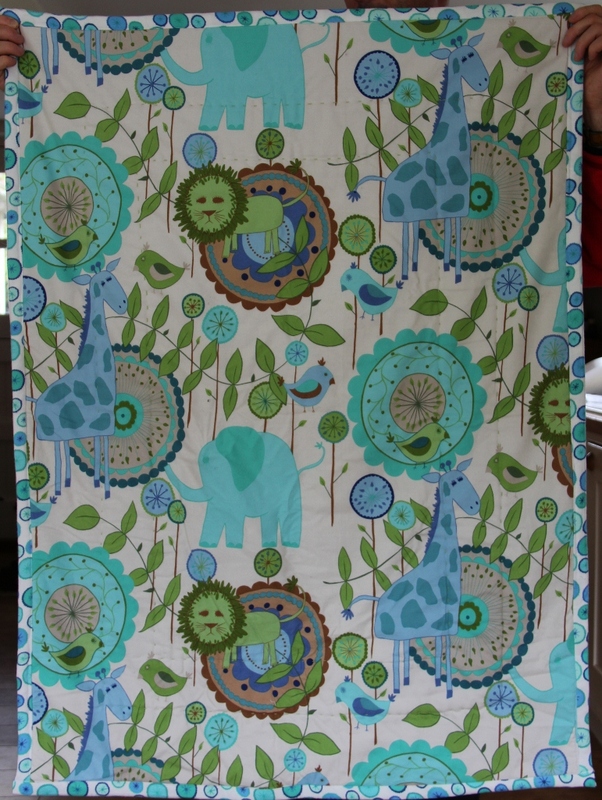 It was a quick and easy project and since the batting was made of fleece it didn’t even need much quilting. The end result was really nice and soft. 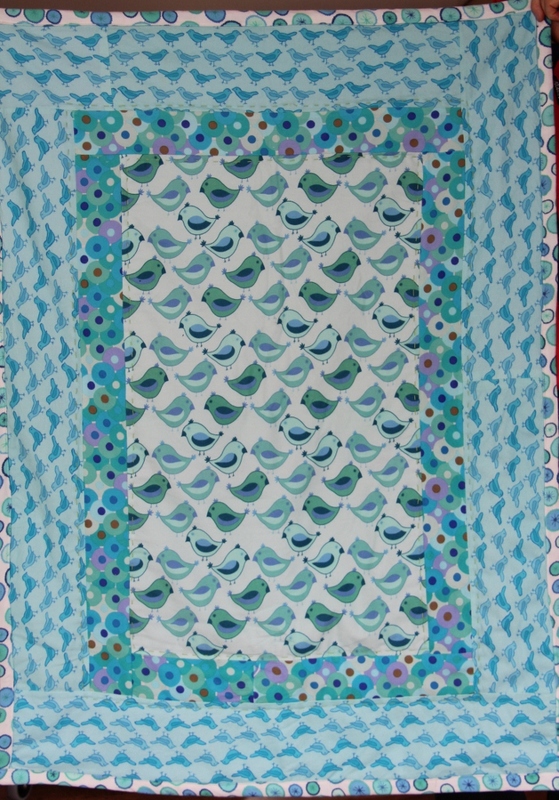 I really enjoy making these quilts, it’s a wonderful opportunity to play with colours and patterns that fabrics for grown-ups just don’t have. Categories: Fabrics, Knitting, Sewing, Spinning, Toys | Tags: homespun yarns, knitted teddy bear, Knitted Toy Tales, knitted toys, patchwork baby quilt, Valori Wells flannels | Permalink. Although recently most of my crafting time has been spent spinning and knitting, I haven’t forgotten about sewing either. 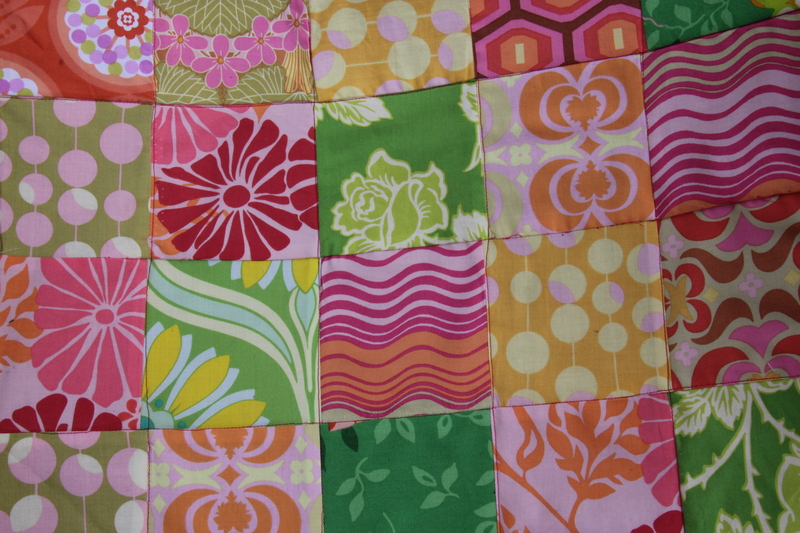 I’m working on a patchwork quilt at the moment which is a wedding present for friends (the wedding was ages ago so I’m really late with this project). It is a double bed-sized quilt, my biggest craft project so far, and it is taking quite a bit longer to finish than I had anticipated. It has turned into a bit of a nightmare project, in the sense that it just goes on and on. Well I suppose it didn’t help that I didn’t like the first version, so I am already on version 2.0… And I’ve realised I don’t really even have the space to work on a quilt project of this size: there just isn’t the floor space where it fits completely which makes things rather difficult. The backing is made of fleece, so I don’t have to quilt it that much, but I still have to figure out where to lay it out in order to attach the layers together. 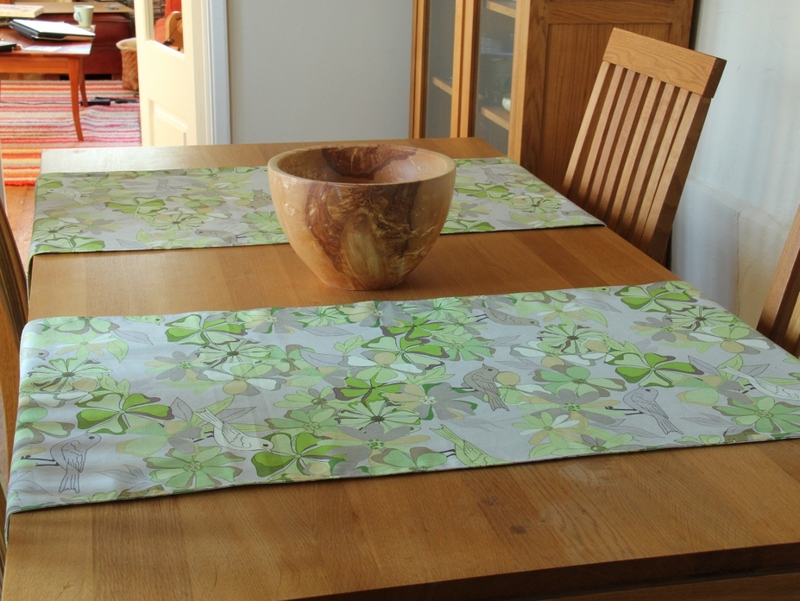 I am thinking of trying the dining table, and see if I can baste it together there one area at the time. 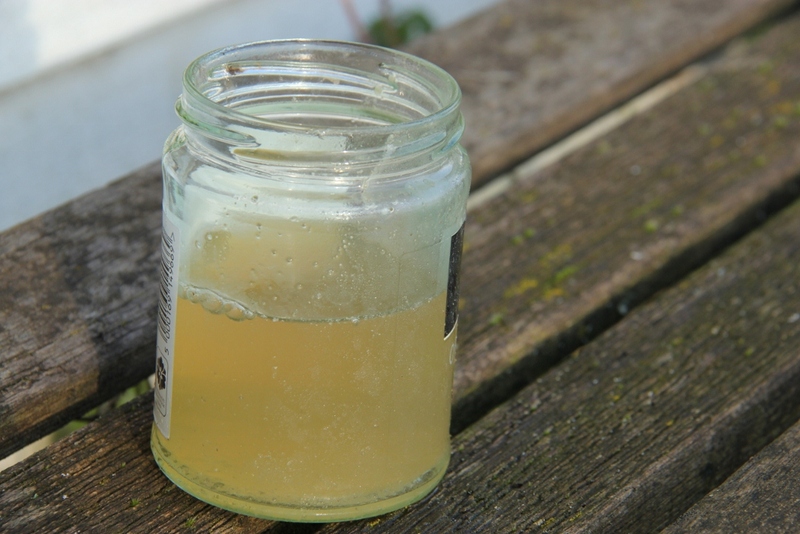 Alternatively, I will have to take it outside and lay it on the lawn… Any handy tips are very welcome! 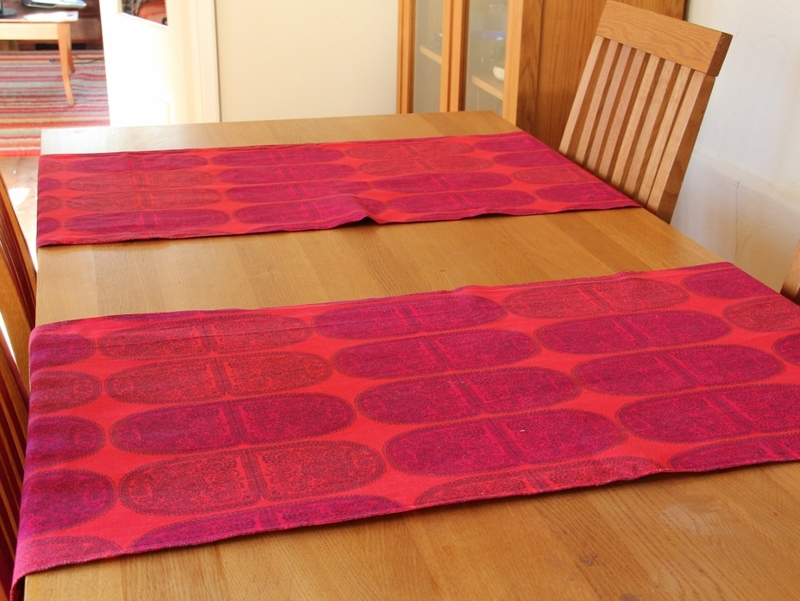 Once I finally get that project out of the way, I’ve got several sets of curtains I need to make. 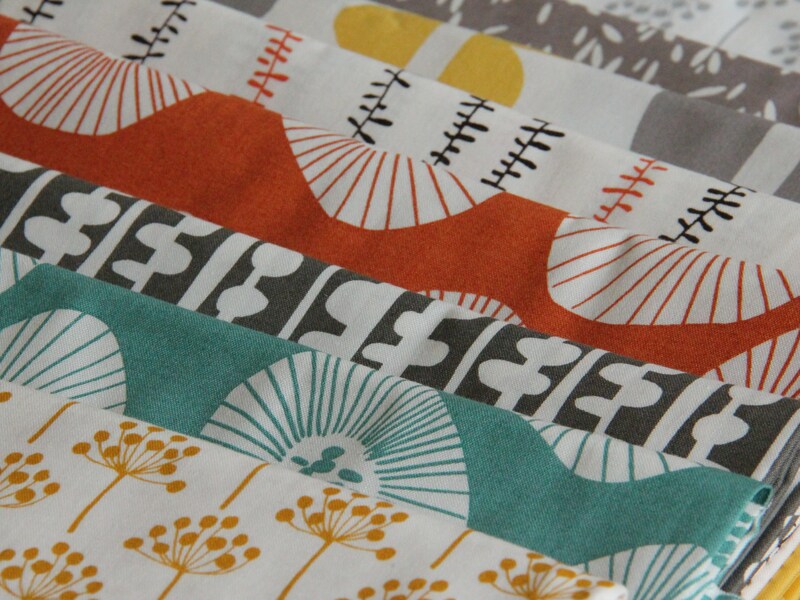 To keep my sewing motivation going, I bought some fabrics by Lotta Jansdotter from Seamstar. I just love them, they look very Scandi, and the colours are great, colourful but not too overpowering. Categories: Fabrics, Sewing | Tags: Lotta Jansdotter fabrics | Permalink. 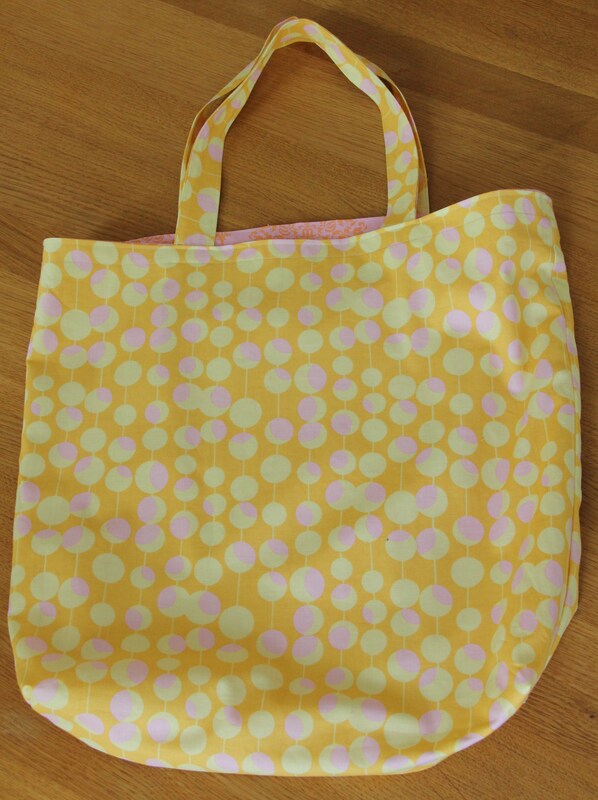 This week I have been working on the shopping bag tutorial. 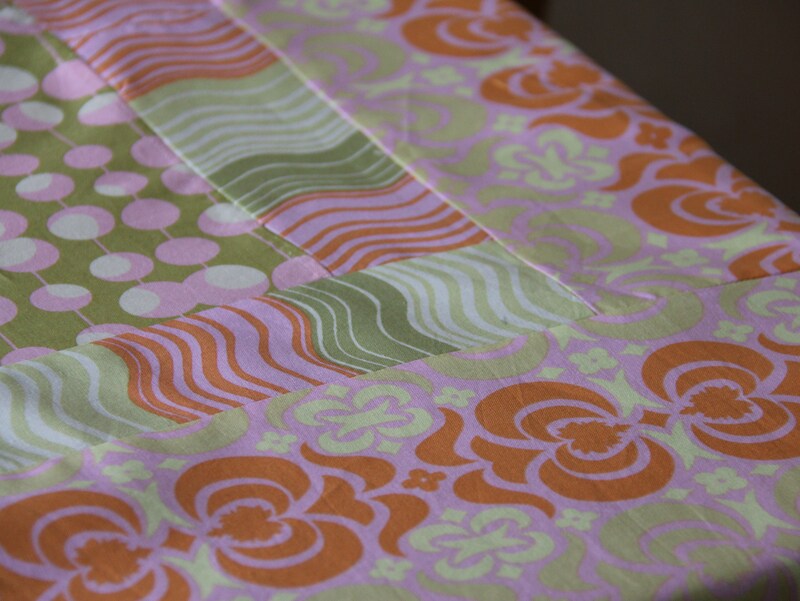 In order to write the instructions, I made another shopping bag from lovely colourful fabrics from Amy Butler’s Mid West Modern collection. I suppose it shouldn’t have come as a surprise how much thought, time and effort goes into writing a clear and detailed tutorial . Writing instructions makes you question the whole process: what you are doing, why you are doing it and whether there’d be a better way of doing it. Needless to say, it took a lot longer than I had anticipated and a few times I did wonder why on earth I had publically promised to write it (now I can’t just quietly back out…). It really makes me appreciate all those countless people on the internet who have written wonderful, informative and free tutorials for everyone else to enjoy and learn from! So here’s a big thank you to all those fantastic people! Regarding my tutorial, I reckon I need to make at least one more bag to try another way of attaching the lining to the main bag fabric, and after that probably one final one to test the process and get the photos done. Meanwhile, at least I am getting lots of new project bags for my knitting. Given that I am working on about five knitting/crochet projects at a time, I need lots of them. I’m quite pleased with this one, I like the girly and summery colours! 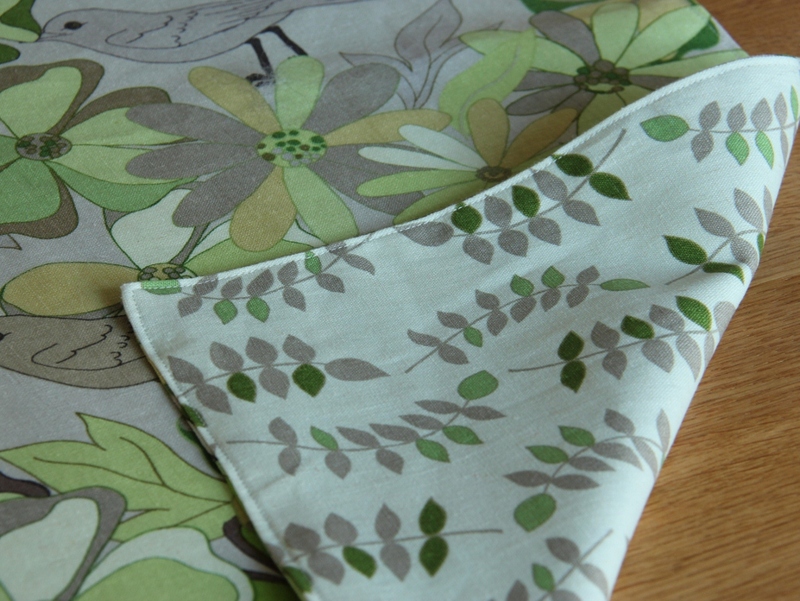 Categories: Bags, Sewing | Tags: Amy Butler fabrics, making a shopping bag, sewing | Permalink. 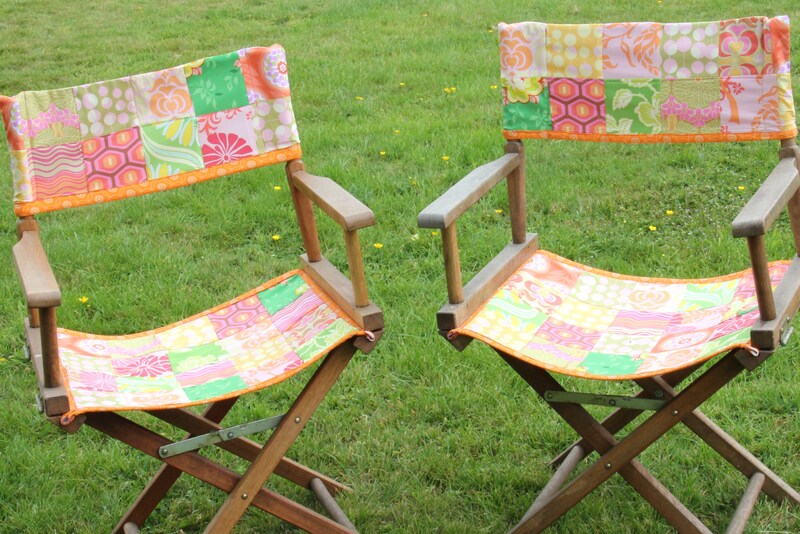 The canvas covers of my garden chairs were getting very faded, and this weekend I decided to give them a make-over. 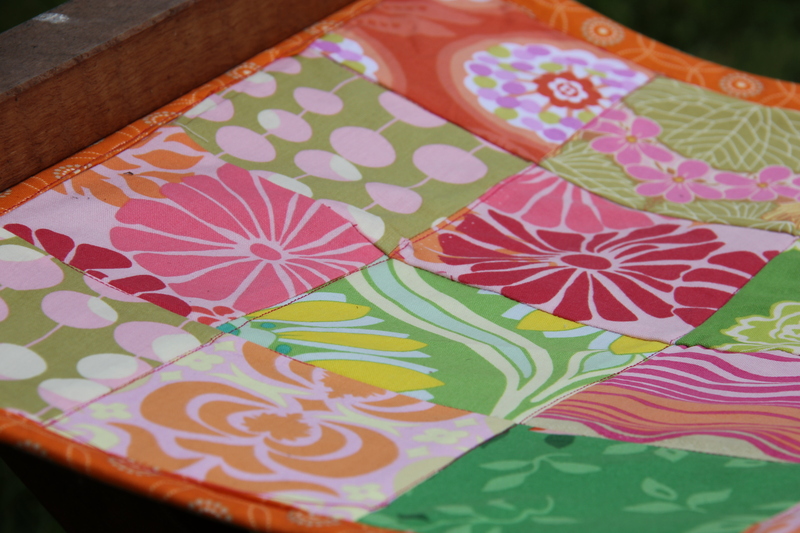 I wanted something bright and summery, and so I chose fabrics from Amy Butler’s Mid West Modern and Heather Bailey’s Pop Garden collections, with a few other fabrics thrown in. Patchwork fabrics on their own are not really strong enough for these kinds of covers, but I left the old canvas inside to provide support. 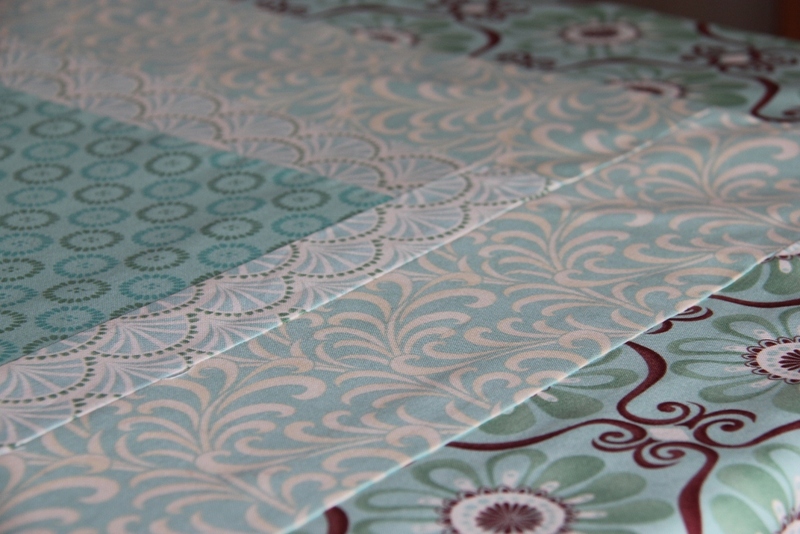 It’s exactly the kind of project I love, allowing me to play with colours and fabrics. 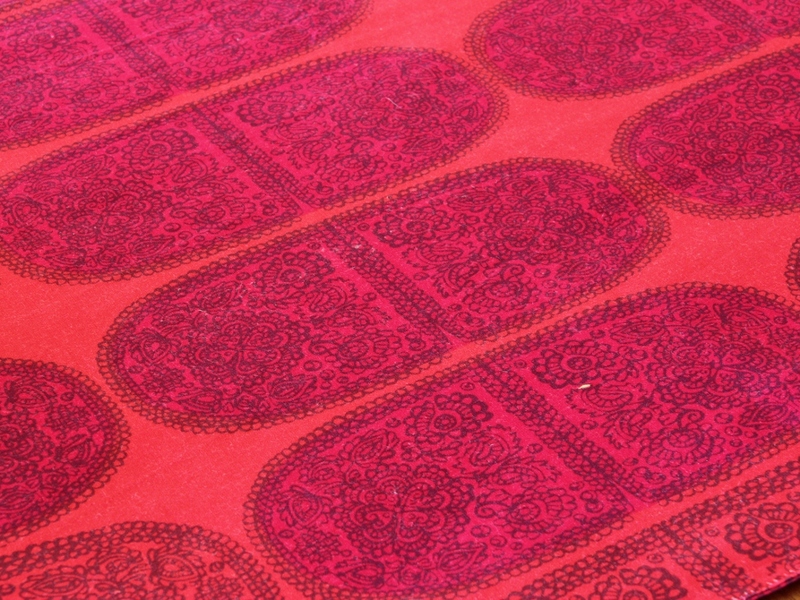 Initially, I had chosen a fairly tonal colour scheme of different shades of bright pink, with some splashes of orange. Unfortunately, this scheme seemed a bit stuffy and dull (if you can call a combination of pink and orange dull…). So it soon became clear that I needed to introduce a bit of contrast. Green being one of my favourite colours I had plenty of those that I could use. 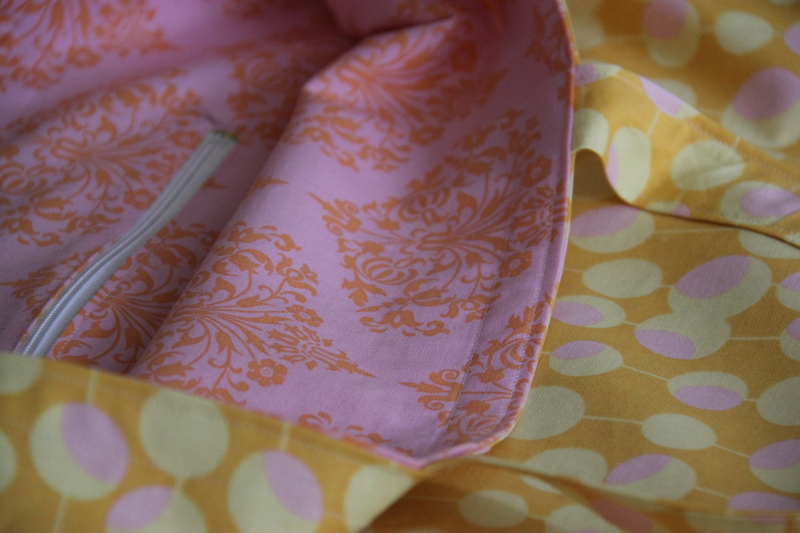 In the end, I added one yellow fabric as well. 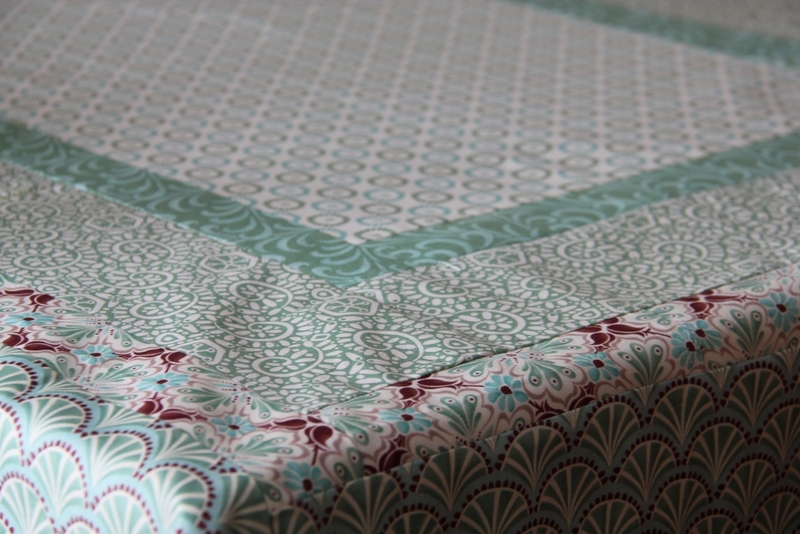 When working on patchwork projects, my first instinct is always to choose different tones of one colour, but in most cases, when I have played with the fabrics a bit more and thought about it, I realise that colour schemes that are too tonal and harmonious just don’t work (at least for me). You need some contrast, so it often takes at least three main shades before the result looks interesting.In this case, the colour scheme ended up being childishly, unashemedly colourful. 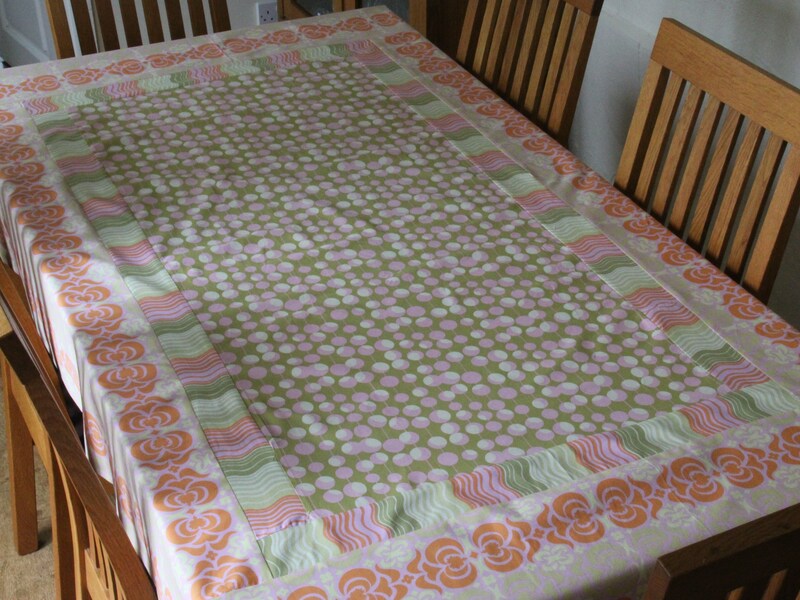 Categories: Fabrics, Sewing | Tags: garden chair covers, patchwork, sewing | Permalink.